What is the difference between Advisor and Aspect in AOP? I am new to Spring AOP. Based on my understanding, I noticed that both Advisor (for example DefaultPointcutAdvisor) and Aspect (for example the class annotated with @Aspect) can both help to solve the cross-cutting problem by doing something more when a method is invoked. What is the different between these two term please? Advice is the way you take an action on your Pointcut. You can use before, after or even around advice to apply any action you defined. Talking about Spring Aspect, it is only a class which is a high level and merge two concepts : jointpoint and advice. It can be done through XML based blueprint, or programmatically. Also you should specify your point where you want to plug in an aspect, it is done by using Jointpoint. Also Spring Aspects and Advice aren't substitute for each other, because Aspects is only merger for jointpoint and advice. Most aspects are a combination of advice that defines the aspect’s behavior and a pointcut defining where the aspect should be executed. Spring recognizes this and offers advisors, which combine advice and pointcuts into one object. More specifically, the PointcutAdvisor does this. Most of Spring’s built-in pointcuts also have a corresponding PointcutAdvisor. This is convenient if you want to define a pointcut and the advice it is managing in one place. 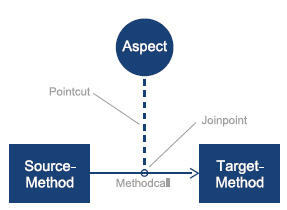 In my understanding, Aspect is just Aspect Oriented Programming jargon and Advisor is Spring Framework jargon. So as you see here NameMatchMethodPointcutAdvisor is an Advisor and it consists of a mappedName, which is the pointcut and the Advice itself, which in this case is MethodBeforeAdvice. And in Aspect Oriented Programming Jargon, an Aspect is Advice + Pointcut, so there you go.. An Advisor seems to be an Aspect after all..
Advisors seem to be an old "AOP lite" type of defining cross-cutting concerns from Spring 1.2 when Java 5 usage was still somewhat uncommon and thus @AspectJ syntax (via Java annotations) not used in Spring. The concept has still survived for lovers of schema-based AOP rather than annotation-based AOP or pure AspectJ syntax, see Spring documentation on advisors. Not the answer you're looking for? Browse other questions tagged java spring aop or ask your own question. in spring, what's the diff between advisor and aspect? Spring AOP: What's the difference between JoinPoint and PointCut?